2018 has been the year of the facial roller. Whether yours is jade, rose quartz or amethyst, the likelihood is that you've factored a little facial rolling into your routine. And while my boyfriend enjoys giving me the side-eye when I'm rolling the gadget along my jawline and under my cheekbones, turns out using a facial roller is scientifically proven to improve your skin. Naoyuki Hayashi of the Institute for Liberal Arts, Tokyo Tech and colleagues at Tokyo Healthcare University and the Research and Development Center, MTG Co. Ltd., conducted a study that proved facial massages done with a roller increased blood flow to the area. "The increase in skin blood flow after applying the massage roller persisted much longer than we had expected," wrote the researchers. Since blood flow is what delivers much-needed oxygen and nutrients to the skin, that's a definite positive. But did you know you can use your facial roller beyond just your face? When I saw that the BeautyBio Rose Quartz Roller can be used on the body, I reached out to the CEO and founder, Jamie O'Banion, for her tips and tricks. "Every athlete will tell you nothing helps sore muscles like an ice bath. Our solid, 100% Brazilian rose-quartz roller is always naturally cold to the touch (a sign that its real stone and not imitation glass), but store it in the refrigerator or freezer for an extra-deep muscle release roll session after an intense pilates or training sesh," says O'Banion. "Use your rose-quartz roller after you have applied your body lotion after a warm bath or shower (morning or night) to help evenly apply and lock in anti-ageing benefits," says O'Banion. "We love using our rose-quartz roller to contour our body," says O'Banion. "Be sure to gently glide in horizontal, vertical and diagonal directions around your stomach, derriere and upper arms. The solid stone helps move edema (fluid retention) that gathers throughout the day to provide an uplifted and contoured appearance." "Take the broad side of your roller and gently roll in a counterclockwise direction to help release pressure from stubborn bowels," says O'Banion. "Just like a body massage, using a roller across the body and towards lymphatic drainage points will help release natural toxin buildup," says O'Banion. "Lymphatic drainage points on the body are near the armpit, inner elbow, lower abdomen and upper thigh." 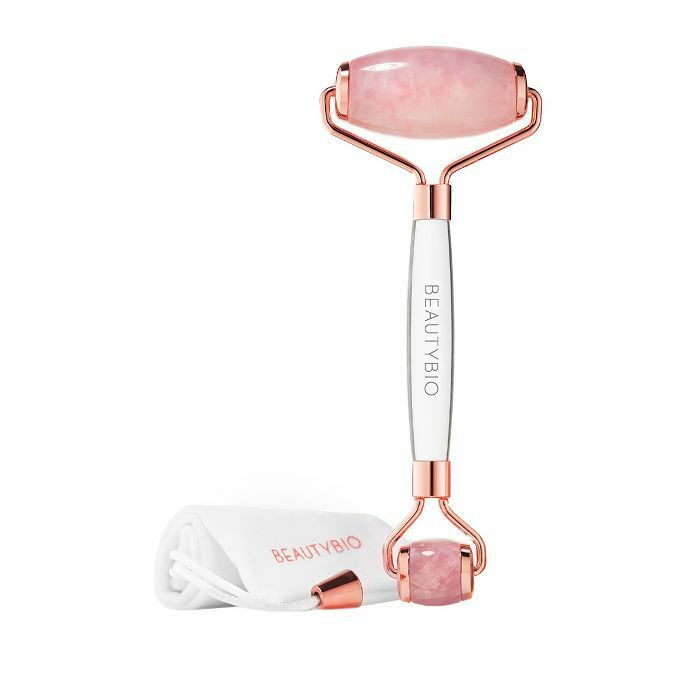 Shop the BeautyBio Rose Quartz Roller below. Now, read more about facial rollers and other youth-boosting beauty tools.